Diplomacy in the Era of Trump | The Gettysburgian. Recently, a friend of mine told me the story of an encounter she had on an international flight while traveling back to the United States via a stop at some foreign airport. Sitting on the plane, she met a man who worked for the United Nations. This man was by no means a top diplomat at the upper echelons within the organization, however, he was a United Nations diplomat nonetheless. Talking to a colleague, he discussed his disapproval of President Trump and made comments on the consequences of his actions in regards to international diplomacy and policies. Unfortunately, the story ended here without specifics or direct expert thoughts, however, it invites one to ponder the importance of diplomacy in the era of President Trump. This opinion piece is inherently partisan– even just the notion of Trump and his policies elicit differing responses from political parties, interest groups, and most especially, Americans. I too have my own partisan beliefs on this subject, however, for the sake of this conversation, I will suspend them (and I hope you, dear reader, will do so as well) and present the facts of the matter and my opinions based off of them. I have the pleasure to serve as the President of Gettysburg College’s International Affairs Association which acts as a facilitator of international discussion and debate, in addition to organizing Model United Nations events and conferences. Since the election of Trump last November, our meetings have always included discussions of Trump’s actions– either directly or indirectly, depending on the discussion topic. Moreover, last spring when our team traveled to London for our international conference, many Londoners asked me to rationalize Trump’s behavior or, given my American citizenship, explain to them what the foreign policy of my nation’s chief diplomat was. More than a year following his inauguration, I still haven’t a clear answer for either question. Trump’s rise to power on the campaign trail, and his subsequent foreign policy (for lack of a better term) during the first year of his presidency has been largely focused on two agenda items: reversion to the isolationist policies of pre-World War II and a seemingly aggressive push to abandon policies, agreements, and actions implemented during the Obama administration. According to Trump, and those who make up his base, allies and adversaries alike have been deliberately weakening the United States; this viewpoint holds that the multilateral agreements negotiated by the past administrations are in the best interests of everyone but the US citizen. Instead, Trump is a staunch advocate of bilateral negotiations where he believes the one-on-one atmosphere reduces the opportunity for foreign nations to take advantage of America and has vowed to conduct foreign negotiations like this moving forward during his tenure. For multilateral agreements that already exist, Trump has noted that he wants to leave them, in favor of being more isolationist or, renegotiate them in a more bilateral setting. In President Trump’s first year in office, the United States has announced plans to withdraw from the Paris Climate Agreement, the Iran Deal, NAFTA, TPP, and the United Nations Educational, Scientific, and Cultural Organization (UNESCO). With isolationism and a focus on ‘America First’, it would seem there is no need for American diplomacy in the era of Trump. In the past year, we have seen diplomatic protocol breached by the Chief US diplomat: at the G20, Trump shoved the Prime Minister of Montenegro so he could stand in the front row of a photo; his Twitter taunts and belittling nicknames directed at world leaders create unwelcome tension; and his expletive laden comments about nations in other parts of the world reflects poorly on our global image. In today’s era, there are innumerable issues that plague the world and no state, however powerful they may think themselves, can solve them alone. From global warming, to world health, to international security, to human rights, the world now, more than ever, needs to come to the negotiation table. Not everyone will agree, and contrary to popular belief, diplomacy doesn’t have to be appeasement– just respect and something to stand for. This belief in diplomacy, and peace in general, is in no way naïve or over optimistic, rather history has demonstrated the inherent desire for humans to achieve either, even in states of conflict. Examples that come to mind include the impromptu Christmas Truce of World War I and the ekecheiria that occurred during Ancient Greek Olympics. Perhaps the most pivotal role diplomacy has played in recent historical memory is the Cold War– a war which was overwhelmingly fought with words. 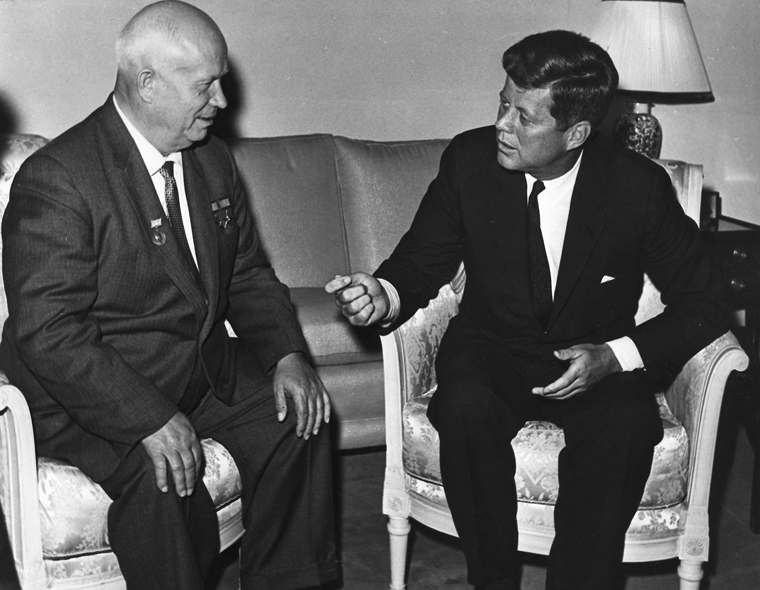 The standoff at Checkpoint Charlie in Berlin, the U2 Spy Incident, and the Cuban Missile Crisis highlight events in which a lack of diplomacy would have led to the outbreak of war between the two nuclear superpowers of the world. Even when the fate of the world doesn’t hang in the balance, diplomacy is often the first (and most successful in my opinion) step toward ensuring it never will. Nixon’s “ping-pong” diplomacy opened US-Chinese relations; the Strategic Arms Limitation Talks (SALT) negotiations improved not only US-Soviet relations, but limited the threat of nuclear annihilation by either; and the Apollo–Soyuz Test Project highlighted the power of soft diplomacy to bring together opposing sides for the benefits of humanity as a whole. Even on non-security related issues, diplomacy has achieved success– notably the global effort that has helped to eradicate smallpox, with Polio most likely being next, and overwhelming will of nations to commit to reducing their reliance on non-renewable energy and focus on ways to recycle natural resources. However, there is much to be done and the United States has always been on the forefront–championing the world to achieve greatness. With the rise of Putin’s Russia and the growing wave of nationalism, the world today is beginning to feel like a redux of the Cold War. Leaders across Africa, South America, Asia, and Europe (well, just Russia for now) will not hesitate to use violence to achieve their end goals and global superpowers (now three of them) seem to be at odds over more than ideology. World leaders with unchecked nuclear weapons stockpiles may activate their arsenals at the slightest hit of provocation, while even leaders of more experienced nuclear states hurry to dust off their silo doors. These threats mandate increased diplomatic activity and a greater respect for the power of multilateral statesmanship. Diplomacy allows world leaders to communicate and clarify misunderstandings so that dialogue isn’t misinterpreted as a threat or provocation. Diplomats serve as a powerful and crucial check to the sometimes heated and inflammatory things these leaders say and do. Regardless of how the Trump presidency effects America’s global reputation, our nation will always be a major international actor, even if our role is diminished in the next three years. The White House and Republican members of Congress must not be so close-minded to the effectiveness of diplomacy, for even when it appears to fail, success can be salvaged from the ashes. Jack Lashendock ’20 currently serves as the President of the International Affairs Association/Model United Nations team (IAA/MUN). He is pursuing a double major in International Affairs and Political Science and a double minor in History and Middle East and Islamic Studies. Lashendock is from Newburyport, Massachusetts and in addition to Model UN, he is involved on campus with the Eisenhower Institute, Student Senate, and Campus Recreation.